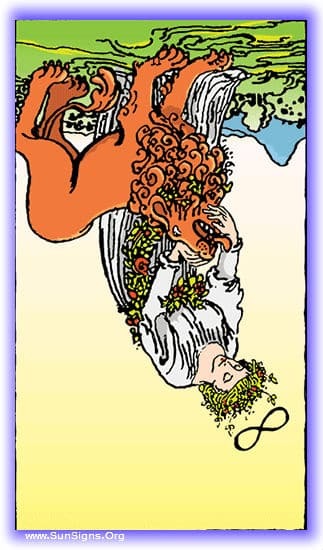 The Strength tarot card reversed represents not just weakness, but in some ways hopelessness. This tarot meditation on the strength card reversed will focus on fear, despair and futility of effort. It shows the desperate panic state that arises when one is letting every mole-hill become a mountain. Lay the grey cloth out, and the candle at it’s top, and the place the Strength card in front of you inverted. As you begin to meditate, let a certain feeling of hopelessness crawl into your bones. Let yourself into the mindset of those who see everything as hopeless, every little set-back as a terrible tragedy. You will find yourself standing at the beginning of a road traveling through the woods. The day is bright and clear, and your destination lies on the other side of the forest ahead. It seems so far though, and the day is hot, so perhaps you should wait until later. Time passes, and the heat has begun to dissipate, so you move from beneath the tree you’ve taken shelter under, and begin walking down the road. On your trip, you take up a pebble in your shoe, it is terribly uncomfortable, and slows you down a great deal, but to take it out is a difficult task, and so you suffer on, slowed down. Eventually it became too much to bear, and you sit down. Once your foot feels less tortured, you prepare to leave again. Then it starts to rain, and you find yourself looking at your empty cup, wishing it were full of that same water. What irony to suffer while the rain falls from the sky, and water runs everywhere! You wait, more time passing, until the rain stops. You then stand and continue on your way, trudging through the mud, stepping over the branches that fell on the road during the rain storm. Luckily, the wet mud that gets into your shoes dislodges the stone, how thankful that is! But you find yourself continuously slowed by the debris in your way, until finally you come to a bridge crossing the river. There are bits of board and debris lying about, and a narrow gap in the bridge. How are you to cross this bridge when it’s not complete! Your frustration overcomes you, and you sit down and weep, so it is here that your journey ends. When you come out of the tarot meditation, let go of the feeling of hopelessness, and think on what you have seen and learned. Stopped every step of the way by issues that could easily have been overcome by an intrepid mind, a little determination. Are there lessons for you in this? Mark in your journal that which seems significant, and remember to try to see every way around an obstacle before you let it stop your progress!